I have upgraded my internet connection from Airtel 128Kbps unlimited plan to 256Kbps unlimited plan. I started using Airtel connection from april 06 and found it very reliable when compared to the crappy Tataindicom Broadband connection. I used this crap Tata Indicom connection for over an year, out of 30 days in a month the connection would be down for 10 days on various accounts justified by TataIndicom. Well now I am a happy man because according to Indian government’s specification I have a broadband connection. 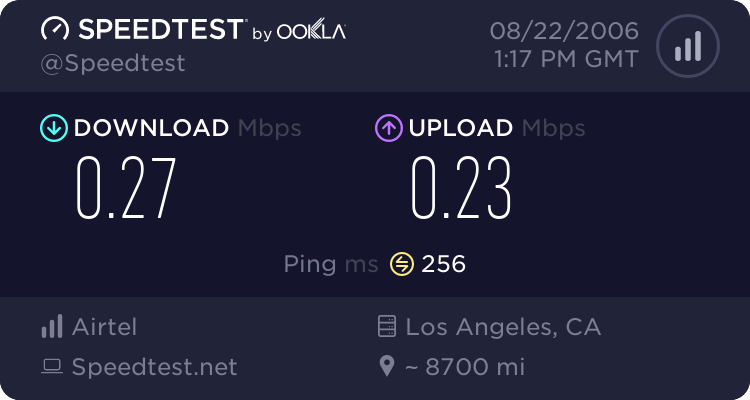 Well what internet connection do you have and what is the speed of your internet connection? % image_title % es Funda iPhone 5Sspecial! You’re going to have to find your books on your own. a military retiree’s career when becoming an Electrical Engineer. to continue or start with college education and with the help of scholarships and grants for single mothers going to college, this necessity is being realized. More people newd to read this and understand this side of your story. we’ve the e-cigarettes flooding inside market. If trans fats are banned, what else might the federal government ban that is certainly bad for us. Thank you, I have recently been searching for info approximately this topic for a long time and yours is the greatest I’ve discovered so far. entirely explained, keep iit up all the time. themselves, and professional service is frequently needed. a variety of appliance installs. Hello friends, its impressive piece of writing regarding tutoringand fully explained, keep it up all the time. with only the green new keepers part a V62 must also be completed. Redneck ricers are everywhere, but none of them can even come close to comparing wioth the David’s Farm redneck ricer.